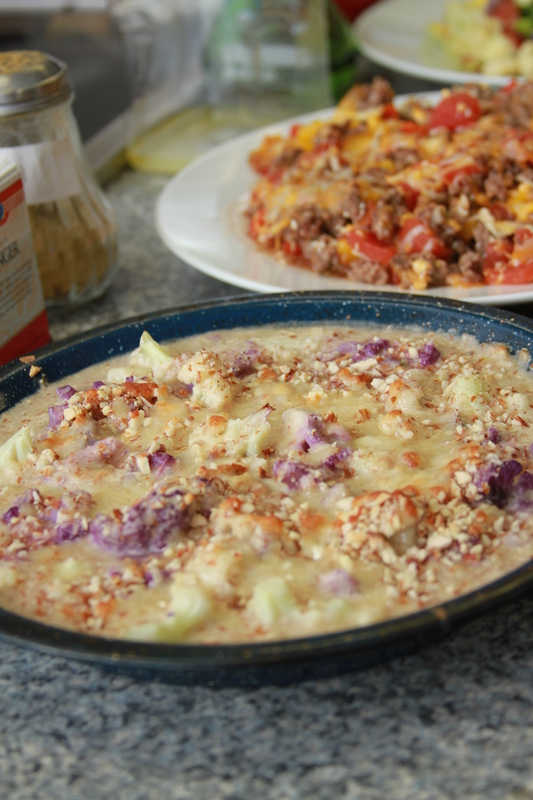 Here is yet another cauliflower recipe! There are so many you can do! This one was super tasty. If you don’t do dairy, just wait, I have all kinds of dairy-free recipes, but today we are going to explore this gratin. Let’s Make it Happen: Preheat oven to 375. Cook florets in boiling pan for 5-6 minutes. Drain. Melt ghee in a saucepan, add flour, stir for 2 minutes. Pour milk into the butter-flour mixture and stir until it comes to a boil. Boil, whisking constantly, for 1 minute. Off the heat, add salt, pepper, nutmeg, 1/2 the Gruyère and Parmesan. Pour 1/3 of the sauce into an 8×11 dish. Place cauliflower on top and spread remaining sauce on top. Combine almond with the rest of the Gruyère and sprinkle on top. Sprinkle with salt and pepper. Bake for 25-30 minutes until the top is browned.